We are pleased to be able to offer worm egg counts and worming advice from our experienced staff as one of our services. Historically drug manufacturers have encouraged the routine use of wormers every 8 -12 weeks however this blanket approach results in wormers being administered to those horse who do not have a worm burden and leads to wormers becoming ineffective. Typically only 1 in 5 horses will need assistance with managing their worm burden and therefore worming is often not necessary. 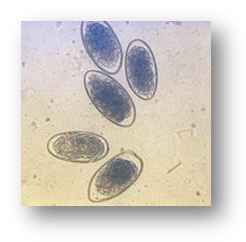 Worm egg counting is the process of preparing a small amount of faeces which is examined under the microscope. The number of worm eggs in a sample gives a general indication of the number of adult worms present in the gut. Using this information and taking into account other factors such a horses previous worming history and their current management an informed decision can then be made about the about the need to worm and the most appropriate active ingredient to use. This approach is known as targeted worming. The cost of a worm egg count is £7.00 inc. VAT or £6.50 inc. VAT when 10 or more horses are tested at once. Samples can be dropped into the clinic for testing or passed to a vet whilst out on their calls. When submitting a sample please ensure it is as fresh as possible and take small pinches from several faecal balls to the equivalent of 1 faecal ball. Some worm eggs such as tape worm and pin worm eggs often do not show up in a worm egg count however in instances where these are likely to be issue additional tests are available to detect for worm burdens. There is currently no test available to detect worms that are in the encysted stage of their life cycle however a good targeted worming strategy will take this into account. We normally recommend worming once yearly with as a minimum with an appropriate product for worms in their encysted stages.